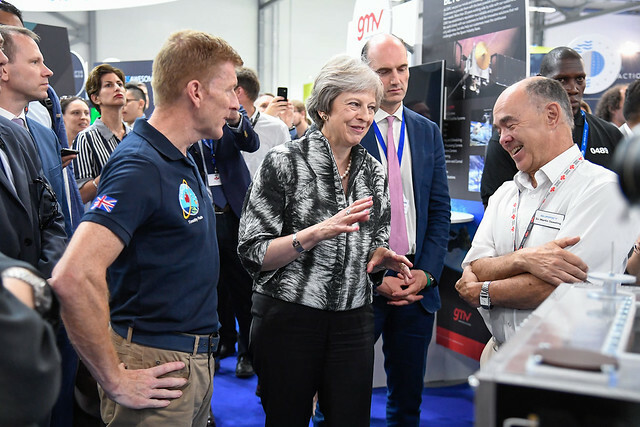 Following a week in which the Prime Minister and several senior ministers expressed their support for the UK space industry, Graham said: “The UK Pavilion has been so busy as space’s presence at Farnborough becomes ever more high profile. The buzz round our industry is tangible and demonstrates how truly inspirational it is for everyone – politicians, the media, students and the wider public. “The UK space flight programme announcement made headline news in association with the Prime Minister’s visit on Monday, followed by Business Secretary Greg Clarke expressing his support for a space sector deal. On Wednesday, Transport Secretary Chris Grayling joined the UKlaunch event, providing his enthusiastic support for the new programme, while Space Minister Sam Gyimah’s statement to the House of Commons made specific reference to a Sector Deal for space. “On Thursday we welcomed International Trade Secretary Liam Fox who described our industry as ‘one of the great enablers of the UK economy’ during a Space Growth Partnership event on exports, at which we announced the launch of a high value export campaign for space by his department.